We have prepared some important changes to the Gruveo subscription pricing as well as to how free Gruveo calls are handled. Over the past several weeks, we have been hard at work optimizing our server infrastructure to bring the costs down. This work is finally bearing fruit and we are happy to be able to pass the savings on to our subscribers. Effective immediately, we are slashing 40% off the Gruveo monthly subscription price. If you already are a Gruveo subscriber, you can take advantage of the new pricing while keeping your Gruveo account. All you need to do is cancel your existing subscription and then reactivate it after the end of your billing cycle at the new price. See this article for details. Along with making the subscription even more affordable, we are also introducing important changes to the free usage of Gruveo. Up till now, all one-on-one calls on Gruveo have been free and unlimited. At the same time, group calls have been automatically disconnected after 10 minutes unless a Gruveo subscriber joined the call. To reduce the confusion and let users experience Gruveo’s high-quality group calling better, we are introducing a unified 20-minute limit to all free calls. (A free call is a call with no logged in Gruveo subscribers on it.) The new limit will kick in on January 25. The new approach means that you will be able to enjoy Gruveo calls up to 20 minutes long with up to 12 people absolutely free of charge and without the need for an account. After your free call is automatically disconnected, you will be able to recreate it immediately for an unlimited number of times. If you are a Gruveo subscriber, just make sure you are logged in while joining your calls. That will lift the 20-minute free call limit as well as enable your other premium features. If you have been relying on Gruveo’s free calling to connect your website’s or app’s users, take a look at the Gruveo API, which we have available specifically for such integration cases. We believe that the new subscription pricing as well as the free calling rules will make Gruveo more understandable and affordable. To start your free 14-day Gruveo trial, click here. We are excited to announce two new features that have just been added to Gruveo: caller blocking and chat history emailing. Caller blocking is a new feature that lets you block callers from specific countries. One piece of feedback that we regularly hear from our users is that they sometimes get unwanted or mistaken calls from abroad. The issue is especially pronounced for owners of popular and easy-to-guess @handles. Head to the new Caller Blocking page in your account on the Gruveo website. Choose a country to block from the drop-down list and click “Add”. Repeat for any other countries that you want to block calls from. Done! You will no longer receive rings or missed call notifications for calls from the selected countries. Note that the callers will still be able to leave you a message if you have the Text Mail feature enabled. Caller blocking lets you easily block unwanted calls from specific countries. Another piece of user feedback that we are addressing with the latest update is the ability to preserve the history of your in-call text chats. With this feature, the chat history is emailed to you immediately after each Gruveo call. No more worrying about losing that link or piece of important text pasted into the text chat! Go to your account’s Notifications and Messages section on the Gruveo website. Check the checkbox that says “Receive chat history for every call via email”. Chat history emailing lets you receive chat logs for your Gruveo calls straight to your email inbox. Over the past couple of weeks, we have been really busy improving the Gruveo call experience on iOS – both in Safari as well as the Gruveo app. The Gruveo app for iOS now supports automatic call reconnection. If your Internet connection drops mid-call, the app will now try really hard to reconnect the call instead of ending it. We first introduced this advanced reconnection functionality in our web app, and now it’s present in all of the Gruveo apps out there, including the Android one. The Gruveo web application has seen a nasty bug fixed where the whole device would freeze during a video call in Safari on iOS 11. Now the Gruveo experience in iOS 11 Safari is as smooth as ever. Ever since launching in 2013, Gruveo has been all about making it really simple for people to connect to each other. We began by enabling any two people to start a video or voice call simply by popping into the same Gruveo room – no account or installs needed. And last year, we added Gruveo handles – permanent usernames that work like phone numbers and let others call you anytime, anywhere. Starting today, we are making handles the defining feature of Gruveo. With this, we are putting handles front and center in Gruveo’s value proposition as a tool for businesses to let their customers get in touch in an easy, secure and feature-rich way. A Gruveo handle is a truly magical thing. Every handle comes with a short link, e.g. grv.to/@myhandle, which, when clicked, starts a call with you right in the caller’s browser. No account or installs are needed, even on mobile! No signups. No new apps. Just click a link. Gruveo runs right in the caller’s browser, without annoying plugins or app installs. Works everywhere it matters. Thanks to the WebRTC technology built into modern browsers, Gruveo video and voice calling works out of the box. Video, voice and screen sharing calls. Get face-to-face with a sales lead, collaborate on a document, or have a simple voice call with a customer. Features you need, when you need them. Enjoy group calling, HD call recording, in-call text chat and much more. Answer your calls anywhere. Use your computer or take Gruveo on the go with our acclaimed mobile apps. Your call, your branding. Reinforce your brand by putting your logo and a custom background on your call screen with ease. You can cancel your Gruveo subscription anytime, and if you do, you will be able to access your account for another 14 days to save your content. What About the Existing Users? We are no longer offering Gruveo Pro to new customers, but if you are an existing Pro user, you can continue enjoying your subscription without changes. Actually, there is one change: Now you can organize group calls with 12 participants instead of 8! If you are a free registered user with a Gruveo handle, you will continue receiving calls on your handle as before. You can switch to the new Gruveo subscription anytime, too, but please be advised that you will not be able to keep your handle if you cancel. Finally, if you don’t have a Gruveo account, you can call handles, join call rooms and have unlimited one-on-one conversations on Gruveo just like you did before. We are convinced that you will like the new Gruveo subscription. To start your risk-free 14-day trial, click here. Last but not least, in this final article on how to use your Gruveo handle for your business, let's have a look at how you can benefit from including your handle in advertisements. 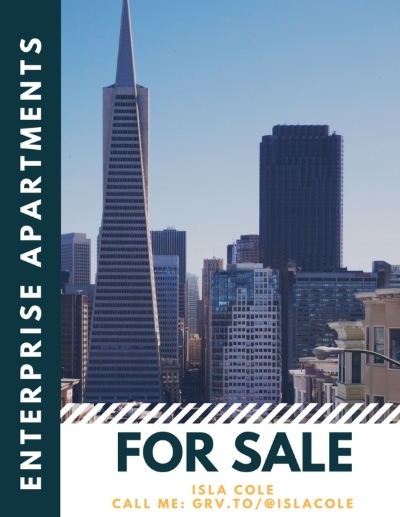 And yes, any kind of printed or digital ad can present your handle and help grow your business. A Gruveo handle in a real estate magazine ad. Firstly, you can ​include your Gruveo handle in your printed ads in magazines, in leaflets (even though these are quite rapidly becoming outdated), on billboards, etc. Anywhere you would use your email or phone number, your Gruveo handle or—even better—your Gruveo call link can be used instead. ...and it will make your Gruveo call experience even smoother! Why should you be excited about a technical "thing" when you're just a Gruveo user? Let us explain. You've finally managed to schedule an important call with your very busy client to discuss a very important matter of your co-operation. It’s becoming increasingly important for businesses to be listed on review websites and various other portals. These, usually large, websites are where people go when they're looking for advice for a particular problem, a comparison of two or more competing products or services, or reviews of whatever they're planning to buy. There are countless websites of this kind, and they cover pretty much every area of life and various types of goods. We're talking about TripAdvisor for hotels, Capterra and G2 Crowd for software, LegalMatch for attorneys, Zocdoc for doctors, etc. You get the idea. A section of a G2 Crowd profile with a Gruveo call link. Have you been looking for a simple way to quickly add video and voice calling into your website or your iOS and Android app? Haven't found the perfect solution? We have great news for you today - Gruveo for Developers now covers all major platforms! With the latest release of the iOS SDK, the package is now complete and ready to enable video calling on websites and apps around the world. The new SDK lets you add a video chat screen to your iOS app and communicate with it using a simple API. The screen comes with all user-facing controls already in place and is the quickest way to add video and voice chat to your application. Great news for the Arabic world! 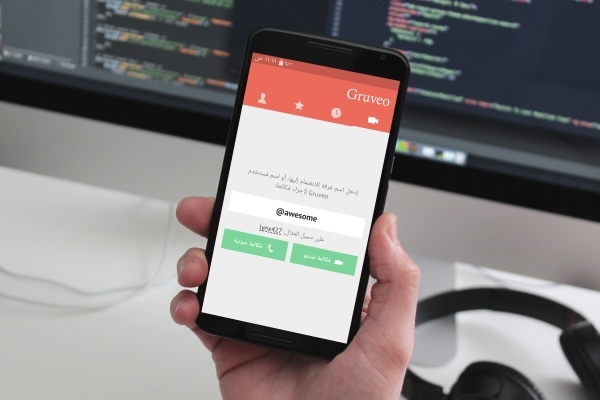 With our latest version that was just released, you can use the Gruveo Android app in Arabic. Even though Gruveo was blocked in the UAE in February, there are still many Arabic users who love using Gruveo, One Call Number For All Your Communications, and would love it even more in their native language. The Gruveo for Android app now offers this option.